Well, I'm frantically getting ready for the North Texas Shoebox Swap this weekend. I've got my card all made, but in case you don't know how these things work, you have to make as many "kits" for your card as the number of people who will be there. That means I have to make 48 card kits. That's a lot of cutting, just so you know! So I'm about 90% finished, after only getting my card all picked out and all figured out on Monday. I miscalculated on some designer paper i needed from Michael's, so I'll be heading there (for the umpteen gillionth time) this afternoon, and will hopefully get it all squared away tonight. Speaking of cutting, last night was fun. I went and got my hair cut and blonde highlights put in. It's been years since I did the highlight thing. I'll have to get my blog picture all changed out real soon so ya'll can see. Then Friday morning is Mani-Pedi day. I never do that either, although my Wal-Mart feet need it more often than not. Next week is the eyebrow wax (but that's as far as it's going--no Brazilian for me, thankyouverymuch!). Anyway, I hope you didn't miss the great release that Verve had just last Friday. It's one of the best so far (but I say that about all of them I think!). This release includes six sets perfect for the men in your life, but some versatile enough for a girlie-girl card too! (Sounds like a deodorant commercial--"Strong enough for a man, but made for a woman".) In fact, Julee is have a wonderful Memorial Day sale now through May 31! ALL stamps are 10 - 20% off! 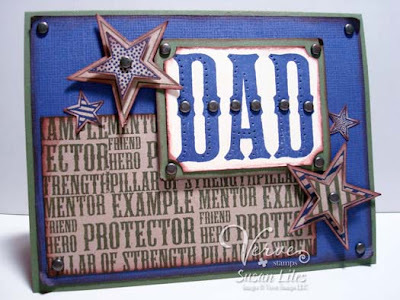 My first card uses the new Up, Up and Away set and Amber's Viva la Verve Sketch for the first week of May (VLVMAY01) and the second one is a Father's Day card using the new Protector set. Two totally different looks, huh! That's what the hairstylist told me last night. She said she wished she had her camera with her and she would have taken a before and after picture---what a difference! Now I can really use the excuse of having "blonde moments"!! Better to blame things on being blonde than "senior moments", right? SUSIE Q-TIP: Sometimes having a button and whatnot in the middle of a bow can make the bow tilt down just a bit from the weight. A good way to solve that problem is to hide one glue dot just behind the bow's knot. I made a rhyme. These cards are so awesome, Susan! 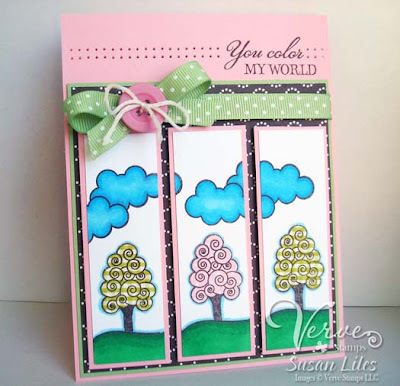 I love the candylaynd whimsical feel of the first one with the pink and yellow trees! How fun! and the Protector card... just stunning! You're a genious to put the little brads in the letters. Love it! The first card is so cute, and the Dad card is AWESOME!! I love all the brads!! Susie, absolutely love "You Color My World". Great use with the colors. The black dp looks great just peeking out. Button accent on the bow super. You inspire me! Every woman deserves to be pampered and it sounds like you are doing just that. Good for you! Please post a pic so that we can see your new hair :>) I loved both cards but the "Color My World" was a favorite. I love how you did the three panels (why do I never think of that?). Great job as always.